It’s the first day of classes. Despite a week’s delay in the opening of school due to Hurricane Irene, the day has gone surprisingly smoothly. No nerves on my part. Well behaved students. All Bollinger insurance forms, emergency cards, and lunch menus properly distributed and tucked snuggly in folders. The bell rings for dismissal, and over the loud speaker I hear the first buses being called. As I look over at the adorable little school bus shapes on my front door that bear the names of each student and his assigned bus, I panic. Every single name has been crossed off in red pen and replaced by another. Not one single student is listed on the bus to which he was assigned a week ago. And I did not do this. As more buses are announced, I frantically try to figure out where to send each child. Because really? What is worse for a teacher than losing a kid on the first day of school? I was put on the wrong bus going home my first day of 1st grade and spent hours driving all over my hometown. It scarred me for life. I can see the tense looks on the faces of my new 3rd graders. After having taught kindergarten and first grade for nearly 20 years, this is a brand new grade level for me. I know what they’re thinking and what their parents will say: Can the “new” teacher possibly be this much of a failure right out of the starting blocks? While I assure my charges that everything will be fine and that they will all get home as planned, one of my grade level partners walks into the room. She asks, with great concern and not a little bit of disgust, if I have begun some grammar/spelling curriculum yet. Thing is? I’ve never heard of this curriculum. Ever. And then I hear a little voice. “Mama, wake up.” It’s my 7-year-old daughter sitting beside me. Relief washes over me. Just another teacher nightmare. You all know what I’m talking about, right? 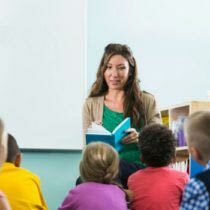 Teacher nightmares are the dreams nearly all educators have, regardless of their tenure in the classroom, in the weeks proceeding the beginning of a new school year. They keep us up at night. They cause us to shoot upright in bed gasping for air. They make us reconsider taking a nice, relaxing job as a stock broker. Or coal miner. Or Navy Explosive Ordnance Disposal technician. Or President of the United States. I can’t speak for other teachers, but I can tell you about my dreams. Mercifully, none of them involve me standing in front of the class in my underwear, though I have been inappropriately dressed in various garments such as nightgowns and mismatched shoes in some of them. Or was that in real life? Even though I spent the month of July working from home and the first two weeks of August in my tropical rainforest, I mean…classroom…moving furniture, hanging bulletin boards, and futilely attempting to get tape to stick to the walls in a place with a dew point greater than that of the Amazon. Even though I have greeted hundreds of eager faces over the past 20 years. Despite all this, I am still a nervous wreck. And the nightmares still come. I have no lesson plans, no books, no paper, no pencils, no crayons. All I usually manage are a few bulletin board borders bedazzled with Day-Glo stars hanging by one staple to the wall. All this nocturnal mind-messing forces me to go into my Really Good Stuffed to the max classroom again to make sure the dreams are not realized. I breathe a sigh of relief as I peer at the organized colored baskets, the newly waxed floors, and the brightly decorated bulletin boards. Phew! Not that any of this will stop me from having yet another nightmare tonight. So, what are your craziest teacher dreams? Leave a comment and let me know. C’mon, you know you have them, too! My classroom nightmare is basically that I am in front of my class teaching and I totally forget the lesson and why I am in front of the class. I look over and my principal is in the back of my room observing me. She is giving me dirty looks and writing lots of notes about how bad I am teaching. I freak out and start having the kids build things to make my lesson look good and get a good evaluation. Then one kid throws up all over the floor and then another. I want to cry and scream all at the same time. Then my alarm clock goes off and I wake up. Thanks for posting. I loved reading your post. When your daughter told you to wake up. I started laughing because I can relate. My teacher nightmare usually involves either I am teaching my new class in my pj’s with little to nolesson plans or the class is totally out of control and won’t listen to a word I say. I am always glad when school starts and the nighmares go away. Happy beginning of school! Oh good grief…you almost gave me a heart attack! I wanted to kill whoever changed those names on you. LOL. I’m glad it was just a bad dream. We have a Kinder that transfers 3 times to get to school! She was much calmer about the whole thing than her mother or I was. All went well on day one and two. So far so good.